Many of those attending a wedding this summer will feel they should have some sort of summery outfit, a linen suit perhaps, or at least something sporty in pale grey. Those who turn up in their dark blue business suit will probably feel a little underdressed, aware they didn’t make an effort. Yet they are probably the most correctly attired people there. Wedding attire has changed over time, just like men’s formal dress generally. What was once the absolute minimum is now the realistic maximum. But there are a fair number of constants, and a range of more or less formal options one can go for while still being satisfyingly traditional. At the most formal end of the spectrum is the morning coat (a version of tails) in black or dark grey. It usually has one button at the waist and tails that fall onto the back of the knees. It is worn with mid-grey striped trousers. Above the waist is a double-breasted waistcoat in pale grey, cream or buff (creamy yellow). Shirt in white or with white contrast collar (preferably separate), most formally wing collar, with an ascot. Then accessories, white linen handkerchief, flower in the buttonhole etc. This get-up is probably what you will get if you hire a wedding outfit. It will be poor quality, fit badly and be stain resistant. Most importantly, it will offer no opportunity for personal expression. So, let’s take the formality down a notch. First, the shirt – this can be a smart white shirt with a normal collar. If you happen to own a contrast-collar shirt, with the body in blue or blue stripes for example, this is the perfect opportunity to wear it. If you have a wing collar shirt of your own (perhaps to go with your black tie/tuxedo) then wear that. Either way, at least the shirt is your own. Second, dump the ascot unless you own one. The one from the rental place will be the same as every groom or wedding guest has worn and will have no personality. Instead wear your favourite tie in a summer hue – perhaps a gold satin, or a Macclesfield grey. Third, the trousers can quite easily be your own. If you own a mid-grey pinstripe or chalk-stripe suit, wear the trousers from that. Even a sporty check is acceptable, as long as it is the right grey to contrast with the very dark jacket. So here is a decent alternative. Rent the waistcoat and the morning coat, and wear everything else your own. They will fit better and probably be of better quality. There are two further options. One, wear the waistcoat from another three-piece suit you own. This should really be either a tan linen, or a pale grey wool. I’m sure there aren’t many people out there who own either, but if you do then the whole get-up is yours minus the jacket. Which is where the stroller comes in. This is semi-formal day wear, but given that everyone else will be in linen suits, it is still pretty formal. The stroller is a short jacket in dark grey or black, single or double breasted, with peaked lapels. Again, it is worn with striped or checked trousers in a contrast grey, and can have the same shirt, tie and waistcoat as mentioned. So wear whichever of these items you already own and combine them. The outfit will be traditional, but you will be largely wearing your own, personally picked and fitted clothes. Perhaps most importantly, you will also look different to anyone else no matter how formal or informal they may be. There is nothing worse than the whole wedding party wearing the same ill-fitting, shiny outfits. It’s supposed to be a special occasion, and they’re wearing nylon. Myself, I own all these items save the waistcoat. But then maybe I’ll have a buff one made before the next wedding I go to. P.S. 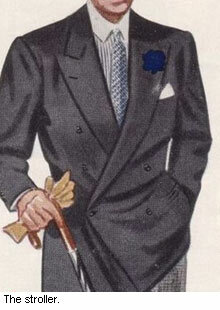 To complete the argument begun in the first paragraph – the next level down from this outfit for a wedding is considered to be a dark suit combining some of these elements, such as a double-breasted waistcoat or perhaps a double-breasted jacket. There is therefore a good chance that your friend who turns up in his dark grey, double-breasted office suit will be better dressed than every ball of wrinkled linen dotted around the church. Linen is for summer, but not for weddings. You can follow the discussion on The contradiction of wedding dress by entering your email address in the box below. You will then receive an email every time a new comment is added. These will also contain a link to a page where you can stop the alerts, and remove all of your related data from the site. I just recently bought two stroller jackets (one black, one mid grey) with the same buttoning as the jacket on the third picture. I’d like to know what the difference is between that kind of buttoning and the ones with two buttons on the outside — are those jackets also considered strollers? Are those jackets considered ok for the office? Had done my wedding shoes shopping at Boden. A very nice summary and so good of you to post the Apparel Art’s pics. I was married in a Stroller. And in the states as well. I’m very proud of that. Just secured a Henry Poole Morning coat. Second hand but made in 2002 and was lucky with the fit. I’ll probably never wear it in the states but I remain hopeful. I’ve just recently discovered your excellent blog and you seem like you might have the answer to this question: I’ll be a guest at an afternoon summer wedding in Italy which becomes black tie-optional for a later dinner. I’d love to wear this cream Margiela suit. Is it kosher for men to wear white/off-white at a wedding? I’d like to share my story and ask for advice about wedding attire. But my fiancé is insistent that he be in a tuxedo. I was having trouble finding a light/medium gray rental tuxedo so I was excited when I found this Jean Yves Tuxedo. Then I learned about the morning suit. 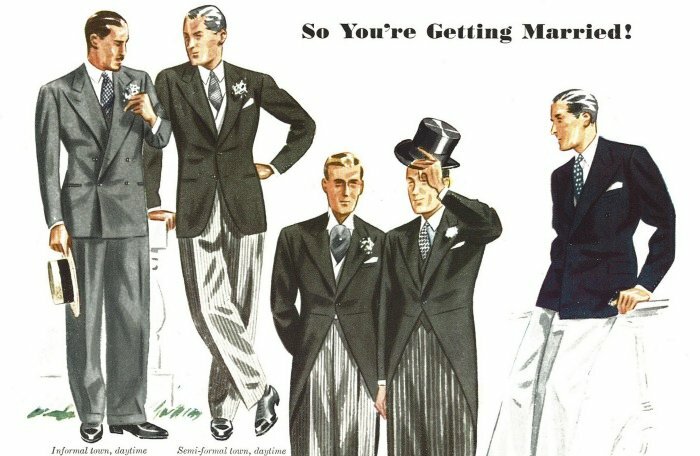 I like the idea of the morning suit best because we are attempting to go for a Victorian/Edwardian themed wedding. I don’t want to require that level of dress for everyone though. Is it okay if I don’t and the wedding party is somewhat overdressed? I’m obviously not interested in a bespoke morning coat for my groom and groomsmen because that would be too expensive for one time wear. Do you like either of these two choices for morning coat rentals in the US? Do you think I should go with grey rental tuxedos? Have morning suits made in China? Or argue for a bespoke wedding suit? If you like one of the morning coat options, is this teal cravat (to match the bridesmaids) for the groomsmen too loud of a color? And is an ivory cravat (to match me) for the groom okay? Do you think a double-breasted waistcoat would be more suitable for my fiancé? Because I asked Graham Browne about having one made in my email to them this morning. – If you do go for a morning suit, tone it down with a regular tie, not a cravat. There is no reason a morning suit has to be worn with a cravat. – And finally, perhaps the best option: a grey bespoke suit, white shirt, grey Macclesfield tie. Plus double-breasted waistcoat if you want to add a more extravagant edge. Very correct, very dashing, and your fiancé has a bespoke grey suit he can wear after the day. Wing-collar in incorrect for all but white-tie. Great article! I thought I’d ask for your expert view: I am getting married this summer and just received the morning coat I commissioned a few months ago. I am hesitating between a white shirt with a grey macclesfield tie, OR a light blue and white winchester shirt (quite hesitant about the tie).. The coat is a black herringbone worsted, the trousers light grey cashmere stripe and the waistcoat a buff double breasted piece. Which tie/shirt combination would you recommend? A question about your discussion of stroller here. You write that a dark grey or black double-breasted jacket with peak lapels counts as a stroller jacket. Could I just take the solid charcoal-grey double–breasted jacket from a double-breasted suit (obviously already has peak lapels), skip the waistcoat (since it won’t be seen anyway under a double-breasted jacket), and use clearly contrasting stripped grey-toned trousers with a white shirt and suitable tie, and I’ve got a correct stroller outfit? If so, each of these items (charcoal-grey double-breasted suit, grey stripped trousers, white shirt, tie) easily fits into a versatile and interchangeable wardrobe, yet can be brought together the uncommon time that a stroller outfit is wanted. Thanks. Am I correct to assume the amount of texture would normally also not be as much as in flannel—basically we need something between worsted and flannel?